We are honoured to announce that in 2018 FiSH Neighbourhood Care was awarded the Queen's Award for Voluntary Service, the MBE for voluntary groups. Jenny Hughes collects her British Empire Medal. Today FiSH combats loneliness and social isolation in older and vulnerable people living in Barnes, Mortlake and East Sheen, enabling them to live independent and dignified lives. We connect the community through a volunteer network offering friendship, support and practical help. FiSH is a registered charity and company limited by guarantee. It is managed by a board of volunteer directors. What area does FiSH cover? 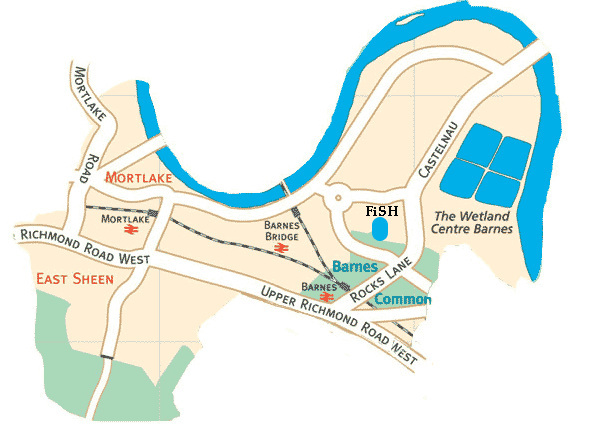 The FiSH 'service' area covers Barnes, Mortlake and East Sheen. All FiSH clients must live in one of these areas as a resident of the London Borough of Richmond upon Thames. Who does FiSH work in partnership with? FiSH Neighbourhood Care works closely with AgeUK Richmond on a day to day basis by providing transport for those attending Barnes Green Centre and various other activities. For many years FiSH has worked closely with RaKAT, Richmond and Kingston Accessible Transport. FiSH is a member of the Dementia Friends Alliance. For further details of these activities click here. FiSH Neighbourhood Care receives grants from the London Borough of Richmond upon Thames but is also supported by the Richmond Parish Lands Charity, Barnes Workhouse Fund, the ​Inman Charity, the Friends of Barnes Hospital, the Victoria Foundation, The Mercers' Company, Goldsmiths' Company Charity, The Worshipful Company of Grocers and other grant-making bodies. Local organisations including the Barnes Community Association and local churches are also very supportive of FiSH and regularly provide financial support for specific projects. Members of FiSH pay an annual subscription however, we rely on donations - and contributions from FiSH clients and volunteers are always very welcome. Click on the button below to send us your contact details. The information you provide will be used to inform you of future news and events. For further information see our Privacy Notice.